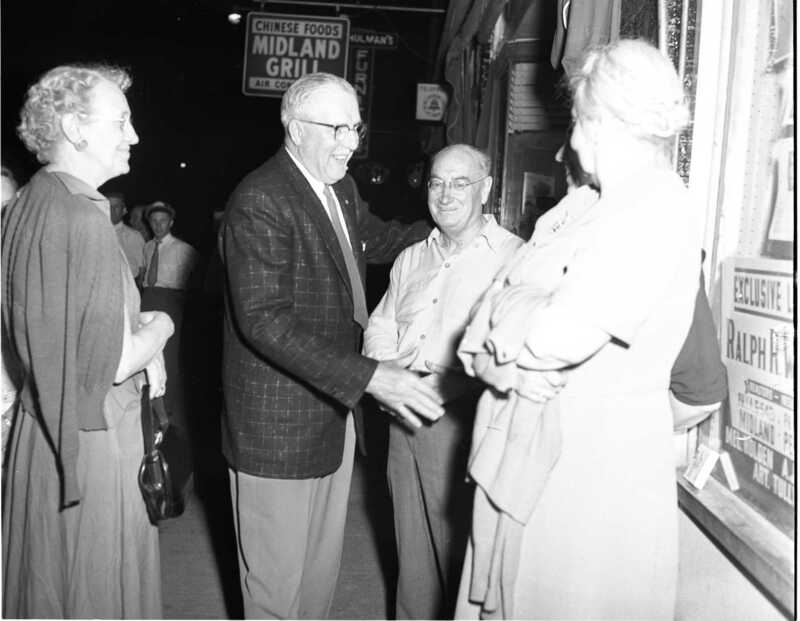 Dr. P. B. Rynard is congratulated by George S. Dudley Q. C. on his victory in the recent federal election, he is our MP for Simcoe East as the Tories return to power after a lapse of 23 years. Jubilant group forms outside Conservative Committee rooms in Midland after the full scope of the nationwide victory became apparent. 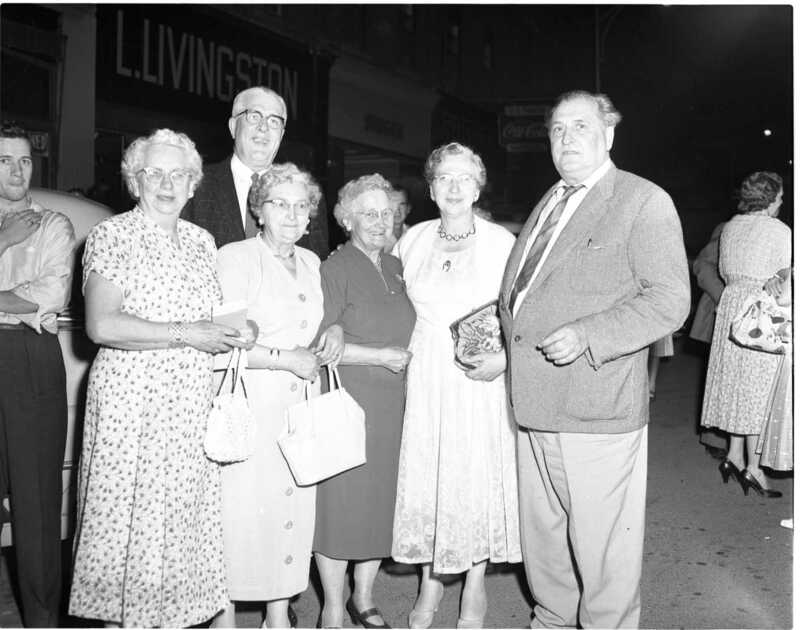 Victorious candidate Dr. P. B. Rynard in the background and others are; Mrs. Percy Hopkins, Mrs. Lily Page of Orillia, Mrs. James Caswell, Mrs. Rynard and Oliver H. Smith. Steep stairs at Poll #8, 209 Midland Ave. made it impossible for about half a dozen voters to exercise their franchise during the federal election Monday night. 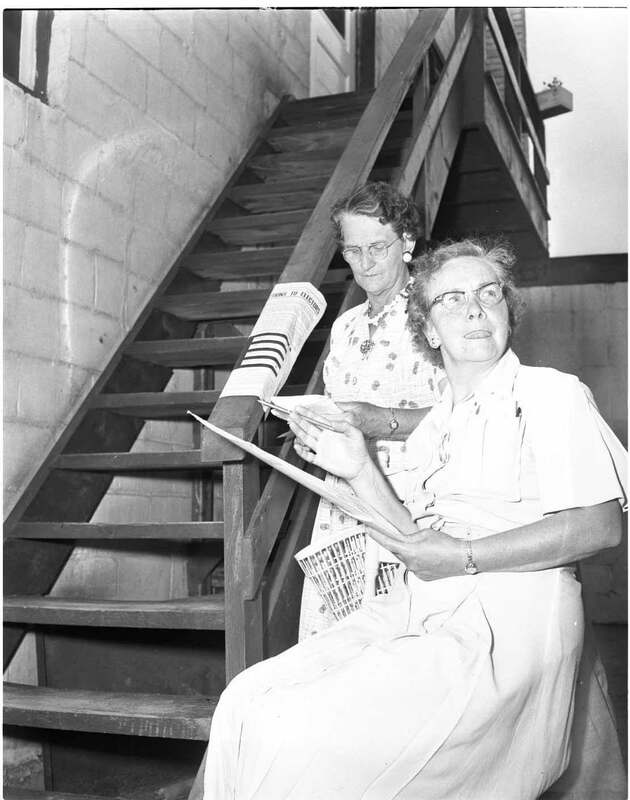 Scrutineeers, Mrs. A. Johnston left and Mrs. Carl Smith said people with poor health or heart conditions were unable to climb the stairs. Three weeks before her 90th birthday Mrs. William Preston of Wyebridge cast her vote in Monday’s election. She was born five days after Confederation. When women got the franchise she never missed an election and “voted Conservative every time”. At left is Mrs. Ernie Robbins. 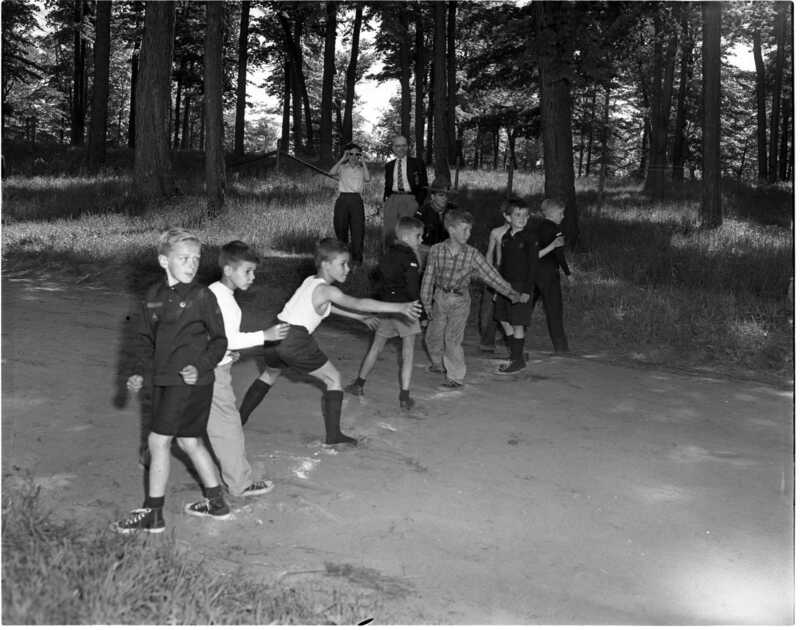 Wolf Cubs get ready for the hand off during a relay race in Little Lake Park Saturday afternoon. Over 150 youth and leaders took part in the track meet that was won by Third Midland “B” pack led by Mrs. Jack Gardner. 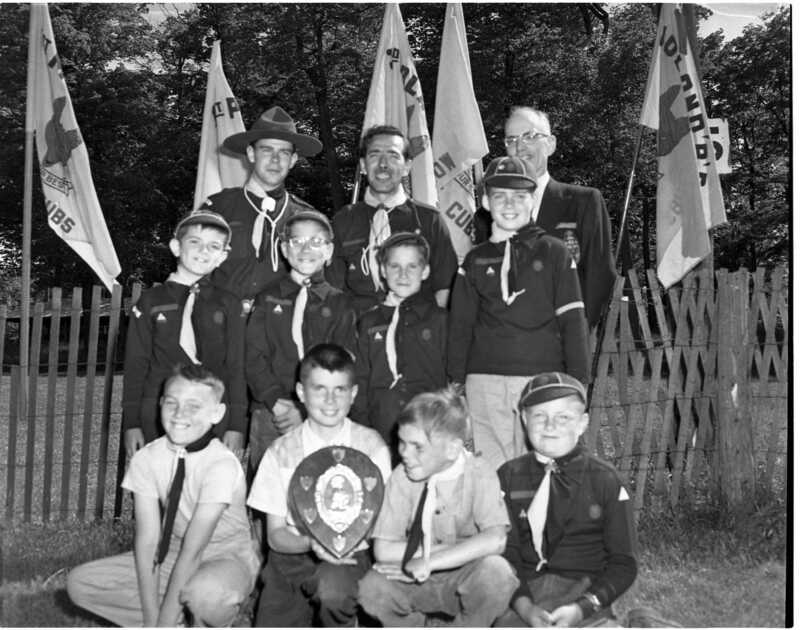 Challenge Shield for the outstanding Wolf Cub Pack in the district in tests passed, was awarded to Fourth Midland pack (St. Paul’s United Church) during a meet at Little Lake Park Saturday afternoon. 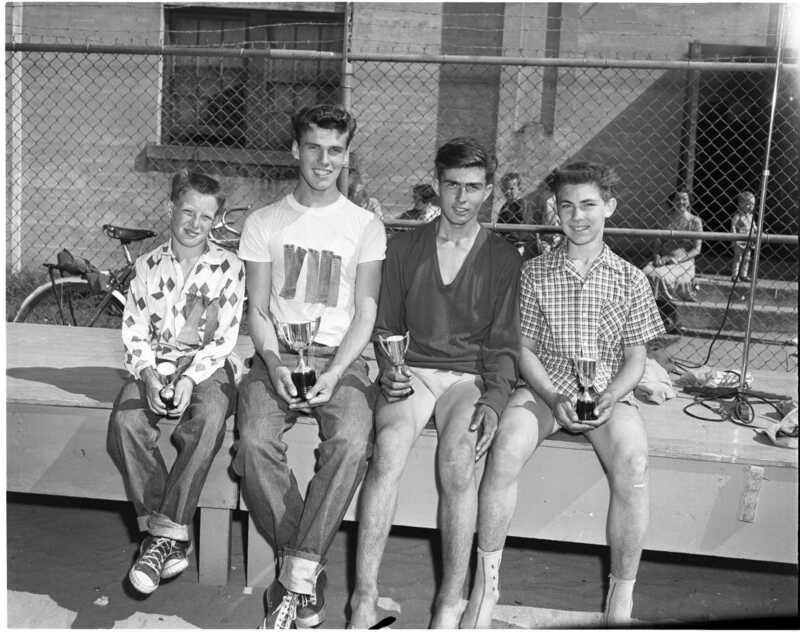 The winners are, front row, Murray Drinkle, Bobby French, Roy Mathis, Gary Sharp; middle row, Jimmy Lounsberry, Tom Atkinson, Doug Atkinson, John Cranston. Back row, Cubmaster Bill Brooks, District Commissioner Harvey Boyd and president Rev. R. D. Wright of SGBD. Water levels in the Great Lakes are at a low ebb in recent years, the private dock and the government dock in Victoria Harbour are almost out of the water and nearly five feet above it. 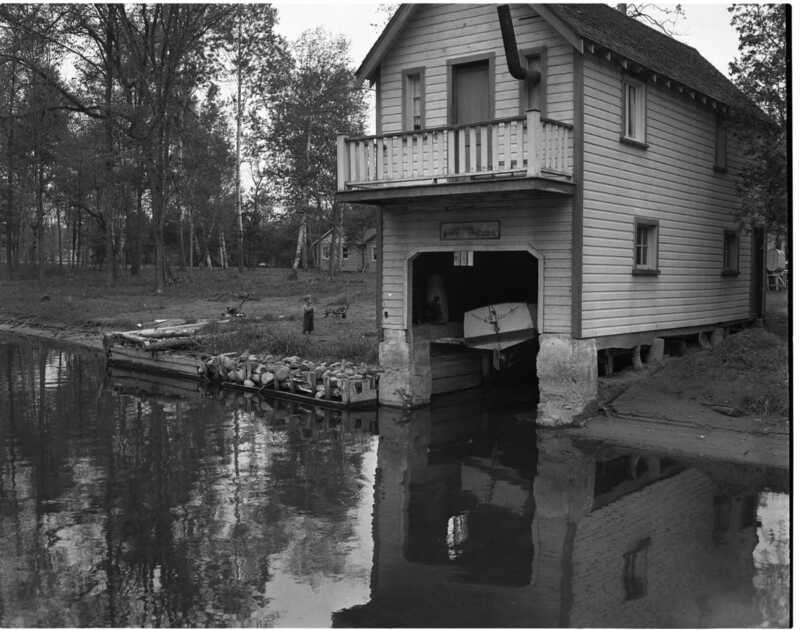 Boathouses along the Sturgeon River are almost useless in the low water along the Great Lakes this year. Cruiser inside is high and dry. Many irate cottagers blame the Chicago “water steal”, but many veteran residents say it is just the natural low ebb of a ten year cycle. These Midland bowlers won the Ontario Bowling Association championship for class “B” teams last month. 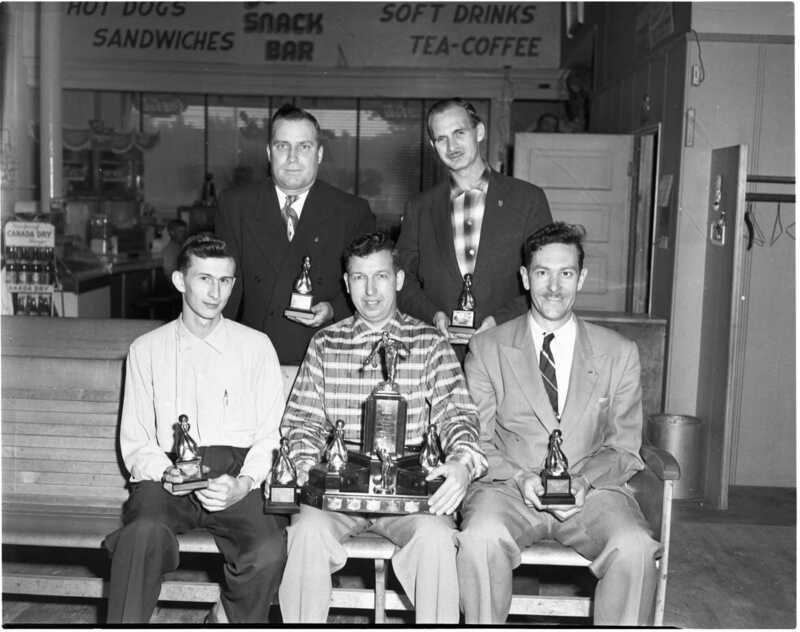 They rolled a total of 3,414 pins in three games to win the Schenley Trophy, and individual cups. 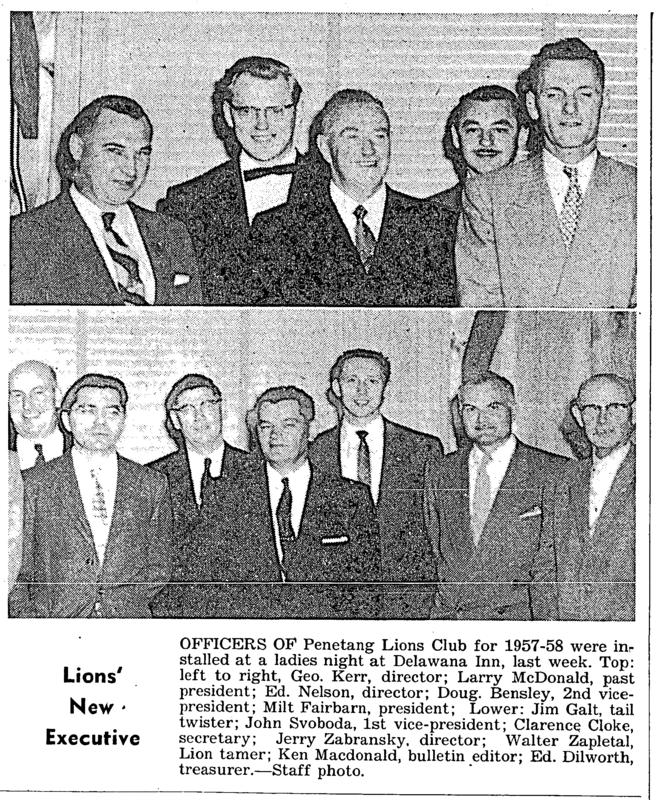 Front row; Don Fox, Doug Martin (captain), Dave Emms; back row, Elmer Todd, Tom Boast. A Midland ladies team finished fourth in the same competition. 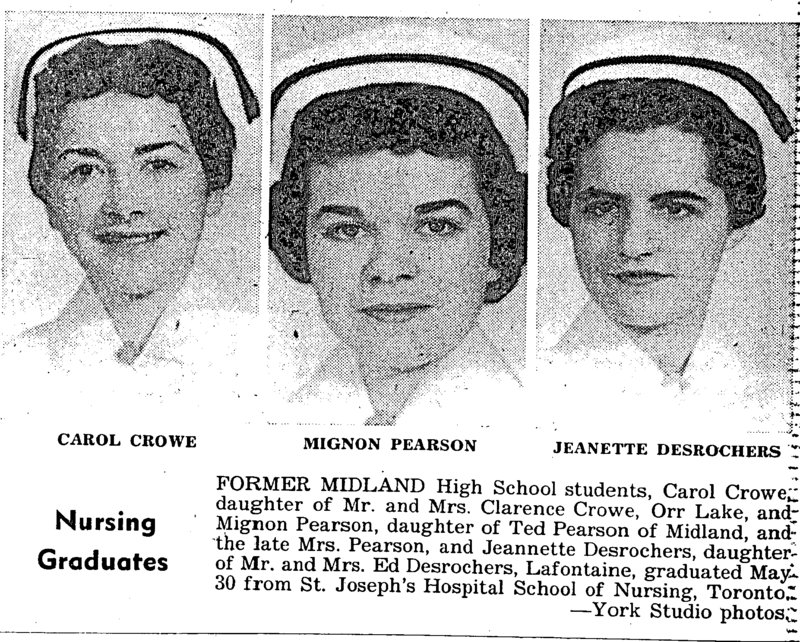 Team members were Marg Ingram, Doreen Hamilton, Bernice Martin, Pearl McIlravey and Alma Marsell. 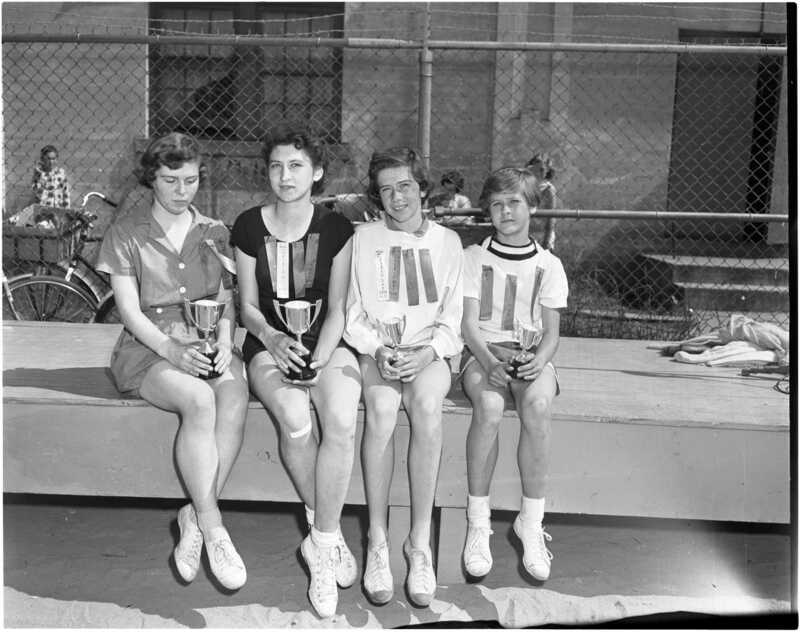 George Ross and Jean Keitel won prizes in mixed bowling, as did Dora Taylor and Joan Gilmore. 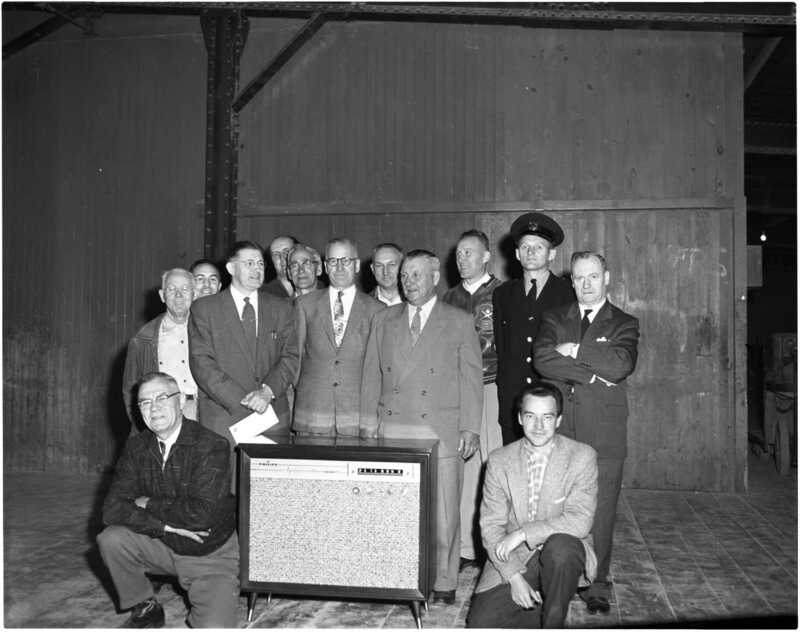 Radio phonograph unit was presented to Jimmy E. Heels on his retirement June 3rd from the CPR. Jimmy has 40 years of service with the CPR and is currently the foreman at the Port McNicoll freight sheds. Kneeling, W. J. Stewart and G. R. Anderson. Standing; John Bridges, Art Bell, S. F. Malin, T. Lewis, E. H. Heels, J. E. Heels, J. Sheehan, W. H. Biggar, S. Thoms, constable John J. Koren and W. A. Paxton. The annual public school field day was held at Midland Town Park on June 5th. Junior trophy winner was David Lamb, senior was Gerald Wotherspoon and tied for intermediate boy were Rodger Leclair and David Stainton. Eight new records were set at the meet. Winners of trophies in the girls events were, Arlene Staruck and Helen Coombs who tied for senior honours; Lynn McAllen intermediate and Nancy Higgs the junior winner. 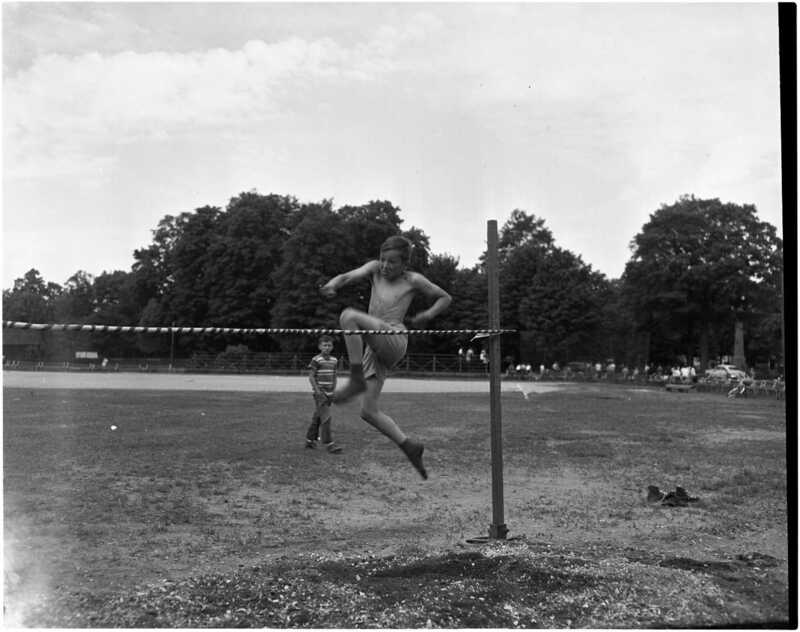 Although he didn’t win the event, David Belsey gave it a good try during the junior high jump event at the Midland Public School’s field day held in the Town Park June 5th. 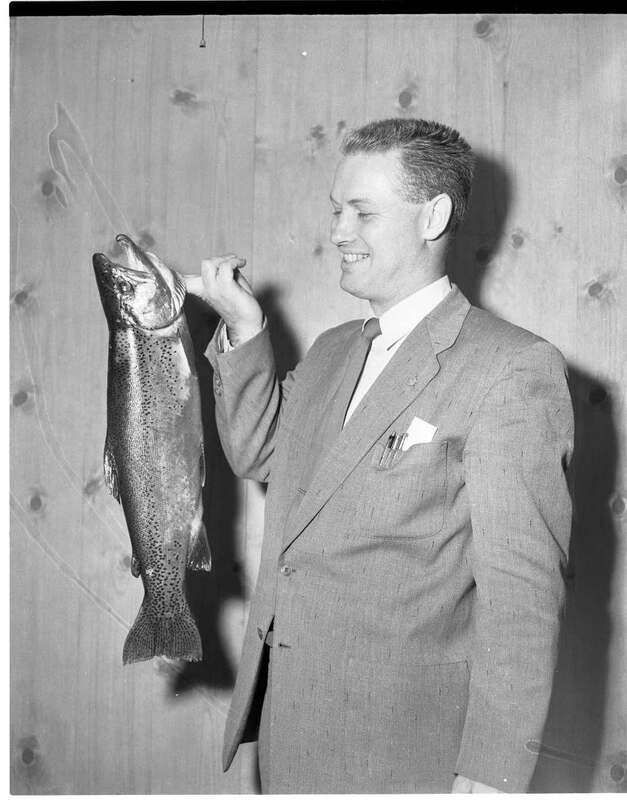 Midlander Bruce MacIntosh displays a proud grin as he explains where he caught this six pound rainbow trout while fishing for speckles with a small hook, six pound test line and a worm; “within ten miles of Midland” was all he would say. With an eye on a career in aeronautical engineering, Raymond Desrochers, son of Mr. and Mrs. Jos. Desrochers, holds the medal presented to him at the University of Ottawa for leading his class. He is taking his matriculation course at Ottawa, and prior to that had shown his scholastic ability at Penetang Public School. Mrs. Blanche Bernier, a Sunnyside resident, was one of the many who took advantage of the free chest X ray clinic conducted in Midland, Tuesday, Wednesday and Thursday by the National Sanitarium Association in co-operation with the Midland Canadian Club, Kitchikewana Chapter IODE and St. Andrew’s Hospital Auxiliary. Headline, Free Press Herald, June 12, 1957. “Tories Score Major Win – Rynard is Riding Victor”. 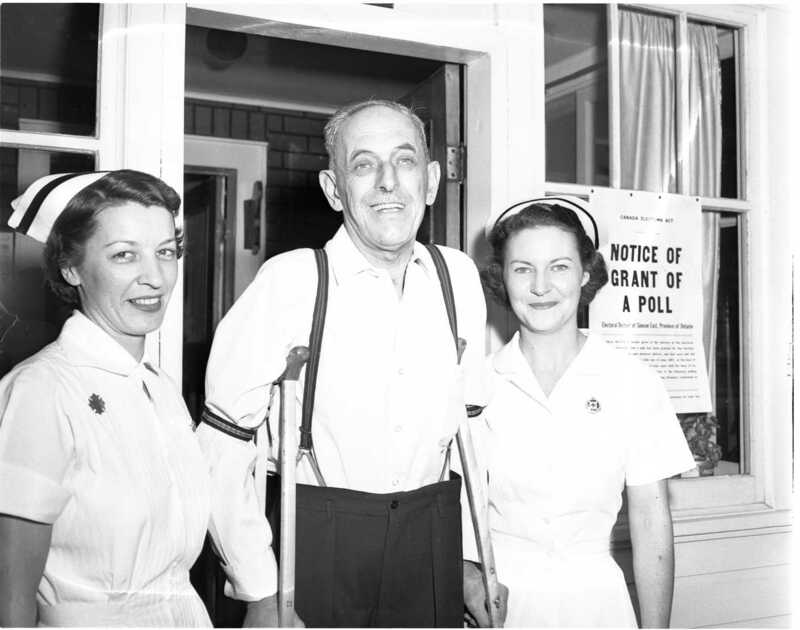 Voters Give Orillia Medico Thumping Majority of 2,195; Mayor Parker Runs Fourth. Comparable to the trend which swept the nation in the federal election Monday, Simcoe East voters swept Progressive-Conservative candidate Dr. P. B. Rynard into office with a thumping over-all majority of 2,195 votes. Headline, County Herald, June 14, 1957. Northern Municipalities Pay Less to County. Share of the total county levy to be paid by municipalities in the northern end of Simcoe County will be lower in 1958 if the unanimous report of the equalization committee, presented this morning, is accepted by county council as a whole. Major shift concerns Midland whose equalization factor is dropped from 1.2518, in effect for this year’s levy, to 1.18 for 1958. Tax saving may come close $5,000. One of this area’s oldest and most esteemed businessmen, J. W. Bald will be honored at Midland’s Roxy Theatre Monday night in connection with “Father’s Day” ceremonies being staged by manager Al Perkins. In choosing Mr. Bald as the honored guest, Mr. Perkins could hardly make any mistake. Few fathers in the area are better known than Mr. Bald, who operated a photographic studio on King Street for a half-century. Now in his 90th year, Mr. Bald is widely known throughout Canada and the United States through the millions of picture post cards he turned out on 30,000 Island and Georgian Bay scenery. Although he closed his King Street studio some years ago, Mr. Bald still carries on his craft at his Fourth Street home. Peggy Watson daughter of Mr. and Mrs. Lorne Watson, Midland, has won, for the second year in succession, a top award in a Toronto swim meet. Peggy won two awards last year and also holds Royal Life Saving Society instructor’s and life saving certificates, obtained while a student at Branksome Hall, Toronto. She is now employed at Eaton’s College Street store. Lloyd Stackhouse of St. John, New Brunswick, has been appointed to Midland YMCA staff it was announced Monday. 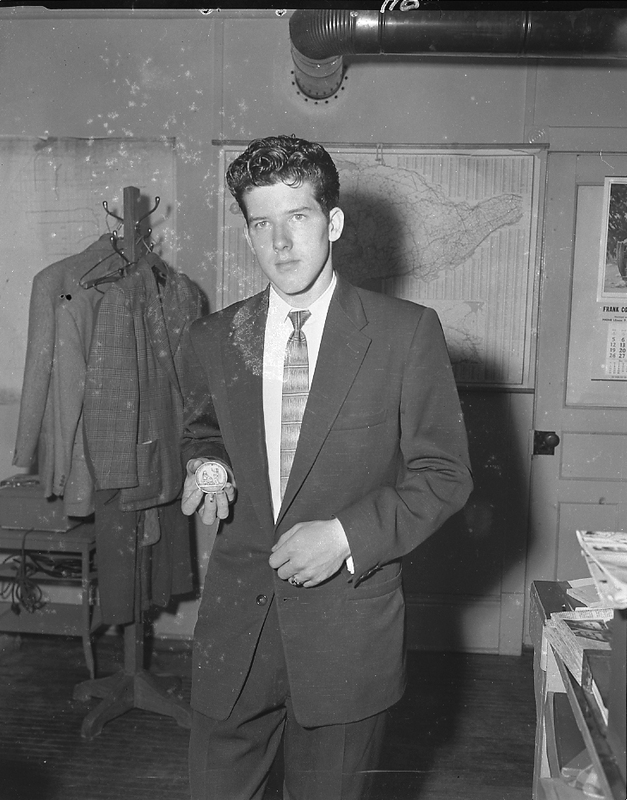 An experienced YMCA worker, he took the St. John YMCA leaders’ training corps. He is proficient in basketball, tumbling and gymnastics and recently received a teaching certificate from the Teachers College in Fredericton, New Brunswick, where his major training was in physical education. Monday night, Midland councillors gave two readings to a bylaw which would prohibit keeping domestic fowl, cattle, swine, goats, foxes, mink and more than two rabbits within the town limits. 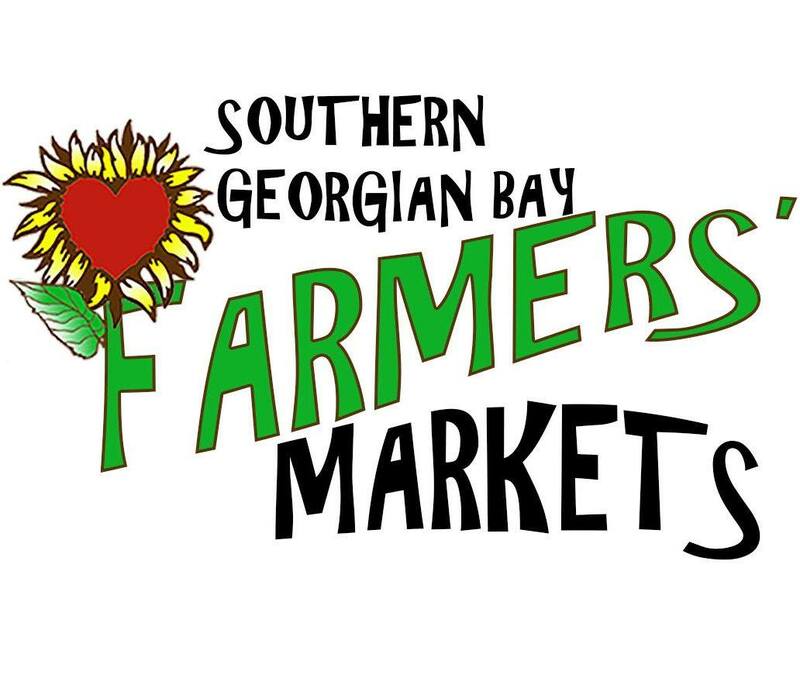 They plan to complete the passing of the bylaw in September. Mindful of the prolific reputation of rabbits, a couple of councillors suggested keeping the limit to one instead of two, but no change was made in the wording. It was estimated there are at least a half dozen cows, three or four goats and hundreds of chickens now being kept in the town. Ten Years Ago This Week A 1,200-pound shipment of food and clothing had been shipped by the citizens of Coldwater and district to aid flood victims in the British Isles. The food and clothing was donated after Coldwater Red Cross branch had issued an appeal to citizens. * ** The CSL freighter Emporer went aground on Canoe Rocks off Isle Royale, broke in two and sank. 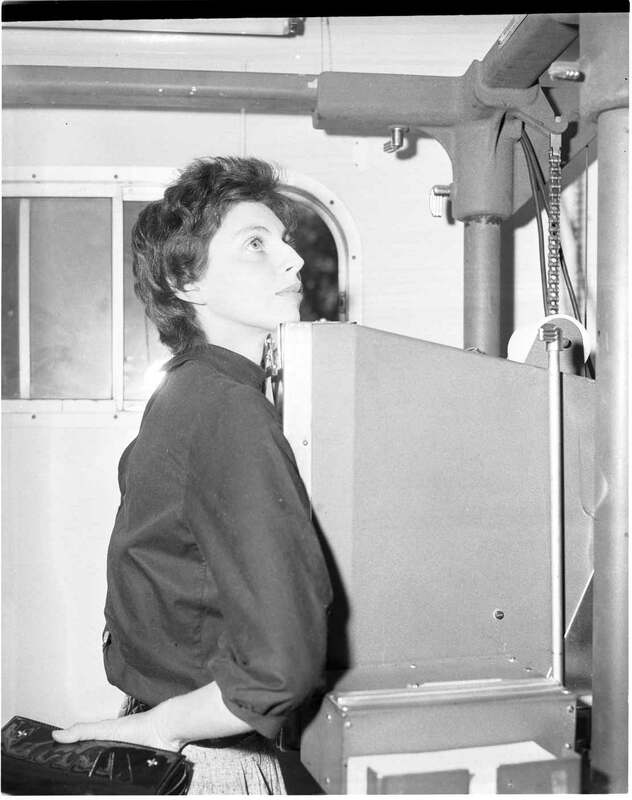 Twelve crew members, including one woman, the captain and one mate lost their lives. Fog was blamed for the shipping accident. * * * Monsignor J. M. Castex celebrated his 51st anniversary in the priesthood. He left June 4 for Ottawa to take part in the Marian conference. * * * Port McNicoll council and citizens decided to let a Toronto firm develop “Flat Point” into a modern sub-division. The point was re-named Paradise Point by the Toronto firm. * * * The annual meeting of the Townships Religious Education Council was to be held at Wyevale United Church. Rev. H. A. Melloe of Toronto, special representative of the Ontario Religious Education Council, was to be special * * * Cold, wet weather had delayed seeding operations on district farms. 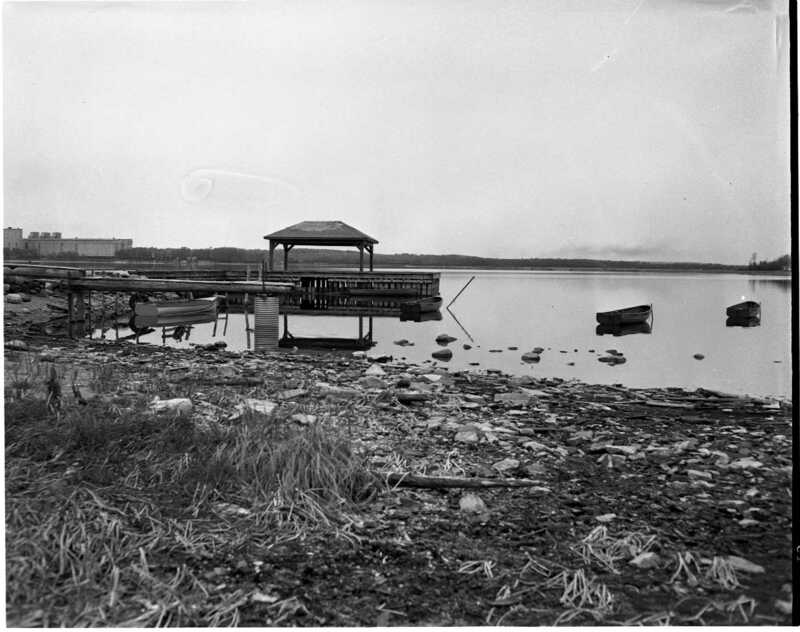 Ontario Department of Agriculture reports revealed that 1939 had been an even wetter spring. 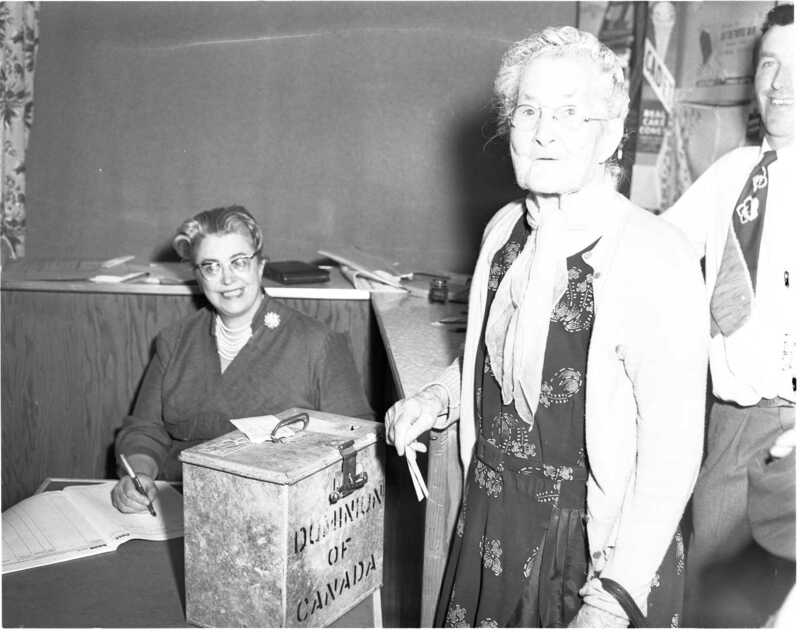 * * * Mrs. Edison Doan of Allenwood had been elected president of Simcoe Centre Women’s Institute. The annual meeting of the W.I.’s was held at Edenvale United Church. * * * A native of Medonte Township, Mrs. Dennis Perry of Tupperville, Kent County, celebrated her 102nd birthday. * * * Lorne Watson had been installed as president of Midland Lions Club. John Bridges had been elected president of Midland Y’s Men at a meeting of the club executive. Thieves who broke into Calvert’s grocery store at Port McNicoll early Wednesday morning are reported to have made off with more than $300 worth of tea, sugar and eggs. Tay Township police chief John Magnus said entrance was gained to the basement of the building, used as a store room, through a screen window. Reported stolen were 23 cases of tea, alone valued at over $300, a hundred pounds of sugar and a crate of eggs. Midland Public Utilities employees Monday will commence full-scale installation of water meters in homes throughout the town. At its meeting Tuesday night the PUC approved a motion to hire additional help to complete the work as quickly as possible. Commissioners were told that 15 meters had already been installed on a test run basis. Average installation cost per meter to date was $3.12, the meeting was told. Wages for any additional help will be $1.50 per hour for a man with tools and $1 per hour for his helper, commissioners decided. Faulty shutoffs found in homes will be replaced at cost of labor if the householder provides the materials. From John Power’s “Outdoor Diary” – George Lott caught a rock bass the other day with a four-inch eel clinging to it. This is the first time I have heard of eels on these fish . . . Ross Hart and I were chasing trout in the Hillsdale area last week when we surprised two Canada geese in a marsh. Anyone know whether any of these honkers nest in our area? (Just try to count their off spring now) . . . Chuck Stelter observed a deer crossing Hugel Ave. at Sixth Street the other morning. Wrestling fans of this area, of whom there are legion, get their first taste of action for this season at Midland Arena Gardens Monday night, with no less personage than Whipper Billy Watson heading the three bout card. Sponsored by Midland Minor Hockey Association for several seasons now, proceeds from the summer-long events go a long way towards providing hockey during the winter season for boys of bantam, midget and juvenile age. It’s hardly likely that Whipper Bill, long a favorite in Midland, will have to use his dreaded Commando Unconscious hold Monday night to defeat Art Neilson, a newcomer to wrestling in Midland. Watson seldom uses the Commando, even on such dastardly characters as Gene Kiniski. After sampling some of Kiniski’s “holds,” most wrestlers feel justified in using almost anything, including the nearest exit. ← Adult Colouring Contest to Win Murder Mystery Tickets!